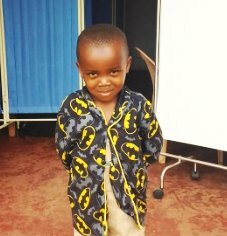 Saul is 7 years old and was born with HIV. He lives with his mother and maternal aunt as they cannot afford to rent a house on their own. His father died when Saul was very young. His father’s relatives have never helped the family and even though his mother’s sister helps she doesn’t have enough money to take care of them as she has 5 other children to support and it is hard to provide the basic needs for the family. The sisters sell tomatoes along the streets of Kalerwe to earn a living. The little money they make is used to pay school fees for Saul. The family live in a one room house and the rent is very expensive. Whenever the landlord comes for the rent, his mother feels bad that she is burdening her sister as she doesn’t have money to contribute to the rent. If Saul could get a sponsor to pay for his education it would be mean a major financial relief for the family but also ensure that Saul has the opportunity to continue his schooling and hopefully have a brighter future for the family. Sulaiman is 5 years old. His father mistreated and abandoned his mother when she was pregnant and this was due to the many wives he had. He wanted her to abort the pregnancy but she refused. She then went and lived with her mother. Her mother felt overburdened and this forced her to chase her daughter away, telling her to look for the father of her unborn baby. His mother went to a friend’s home and started working as a maid and she was also provided with food. However, the friend couldn’t continue to pay her and she went back to her mother and pleaded for help until she gave birth. Things did not work out for her, she was in a relationship and at the time they separated, she was pregnant. She went back to her mother’s house and after the baby was born she looked for a job to support her two children. It was very difficult getting enough money to support the family. She met another man but this did not end well as he took her to his brother’s home and gave her alcohol and she lost her senses. She was raped and became pregnant and this was the last time she saw him. The 3 children are not supported by their fathers and they have no role in their children’s lives. Sulaiman’s mother does some cooking of chapatti to earn a living. Unfortunatley it does not cover the basic needs and her relatives won’t help her saying that she ‘spoilt’ herself and that the fathers should support their children but they are not around and have no intention of helping their children. The mother wants her children to have the opportunity to go to school and have a better future. But this does not seem possible without the support a kind sponsor. Derrick ‘I am 17 years old and am in Senior 2. My parents died of HIV and I am living positively with HIV. My eldest brother supports me by paying my school fees. He sells handkerchiefs on the streets. He had to leave school in Senior 2 as our mother became very sick, he had to find work to support the family. We lived in a grass thatched house since we had no money to rent a home but later our grandmother inherited a one roomed wooden house and this is where we all live. Our grandmother Rebecca not only takes care of me but 4 other grandchildren as well. She doesn’t have a serious job apart from taking care of the neighbour’s children and she is given some little money by the parents when they pick up their children. Often we go to bed with empty stomachs as there is no money for food. Granny Rebecca says her concerns are not having the money to pay school fees and providing them with regular meals as she can’t stand to see the children go hungry. 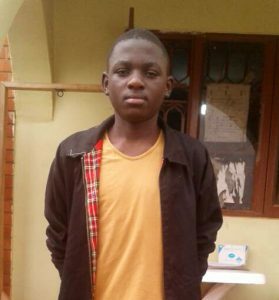 If Derrick was able to find a sponsor to pay his school fees it would alleviate the some of the financial pressure on the family. These children are just a few of the 95 children who are on our waiting list and who would love to go to school. I hope you can assist the children and their families look forward to a better future.